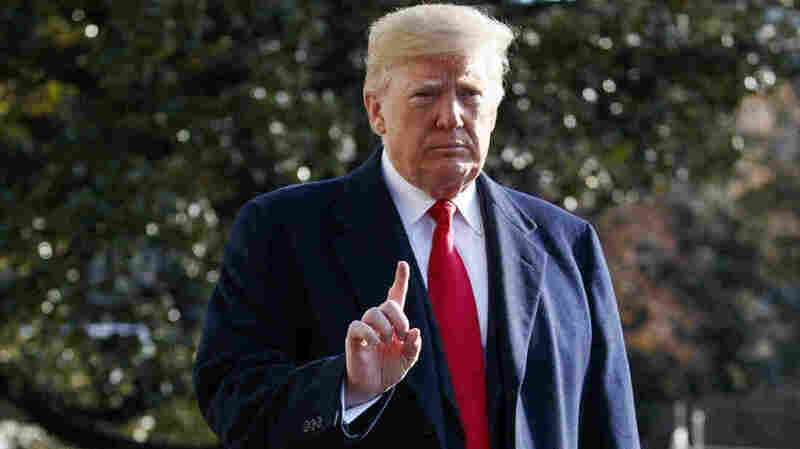 Trump To Pick William Barr As Next Attorney General The Justice Department veteran served as attorney general under President George H.W. Bush and now serves as a corporate lawyer. He's said to hold an expansive view on executive power. 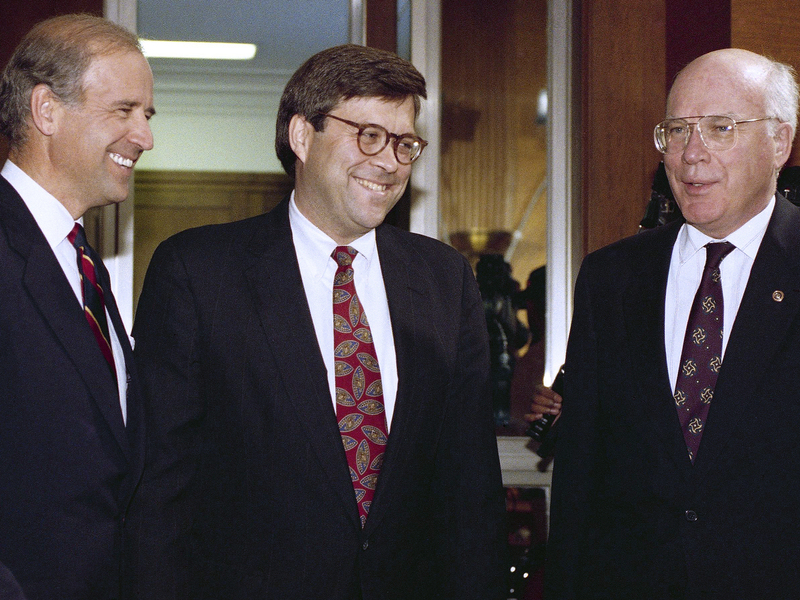 Attorney general nominee William Barr (center) chats with then-Sen. Joe Biden and Sen. Patrick Leahy, D-Vt., before Barr's hearing on Nov. 12, 1991. Barr would take over a department that has come under frequent attack by the president. Trump has repeatedly lashed out at the DOJ and the FBI, accusing them of harboring anti-Trump elements who seek to torpedo his administration. If confirmed, Barr would replace Matthew Whitaker, who stepped in as acting attorney general after Jeff Sessions resigned in November under pressure from the White House. The largest source of friction in Sessions' relationship with Trump was his decision to recuse himself from the Russia investigation — a move that Trump viewed as a betrayal. Depending on how long his Senate confirmation takes, Barr would likely oversee special counsel Robert Mueller's probe into possible ties between the Trump campaign and Russian intervention in the 2016 election. During Barr's first stint as attorney general, Mueller served as the head of the department's criminal division, which pursued several high-profile investigations at the time. It is unclear how Barr views Mueller's ongoing Russia investigation. But Barr has expressed concerns about political donations made by members of Mueller's team. In 2017, he told The Washington Post that "prosecutors who make political contributions are identifying fairly strongly with a political party." Barr added that he "would have liked to see him have more balance on this group." He also has suggested that Trump's calls for the Justice Department to investigate his 2016 opponent, Hillary Clinton, weren't improper. "There's nothing inherently wrong about a president calling for an investigation," Barr told The New York Times. "Although an investigation shouldn't be launched just because a president wants it, the ultimate question is whether the matter warrants investigation." He went on to say that a 2010 uranium deal that was approved when Clinton was secretary of state merits further investigation. President Trump announces that he is nominating William Barr, attorney general under President George H.W. Bush, as his new attorney general. Trump, meanwhile, has kept up his attacks on Mueller and the Justice Department. He said on Twitter on Friday, for example, that his legal team is already preparing a rebuttal to the report that Trump expects from the special counsel's office. Barr, 68, has extensive experience in government, particularly in the upper echelons of the Justice Department. In addition to his stint as attorney general, he also served as deputy attorney general from 1990 to 1991, and as assistant attorney general in charge of the Office of Legal Counsel for two years before that. Trump hailed Barr's track record in a tweet after his announcement at the White House. That experience also is viewed as a plus by Republicans, many of whom have welcomed Barr's nomination. Sen. Lindsey Graham, R-S.C., a key Trump ally and top member of the Senate Judiciary Committee that will consider Barr's nomination, called Barr a "highly capable, highly respected pick." Other supporters cited Barr's past experience at the Justice Department, suggesting his chances appear good to be confirmed by the Senate. "Bill Barr is exceptionally well-qualified," Sen. Roy Blunt, R-Mo., said in a statement. "He understands the job and will have the confidence of the Congress as well as the president." Democrats, meanwhile, acknowledged Barr's pedigree but said they think his lengthy track record requires further scrutiny. "Barr is an experienced and able lawyer," said Sheldon Whitehouse, a Rhode Island Democrat and member of the Senate Judiciary Committee. "I will have questions about his record and positions on pressing issues facing the Department of Justice, particularly his willingness to defend the department's investigations — including Bob Mueller's — now looking at the Trumps and Trump cronies." One particular aspect of Barr's past that Democrats are likely to delve into in light of the ongoing Russia investigation is his support for the pardons that President George H.W. Bush granted to half a dozen former officials caught up in the Iran-Contra investigation. The pardons canceled out one conviction, three guilty pleas and two pending cases that were part of the work of independent counsel Lawrence E. Walsh. Barr's nomination also has been met with concern by civil rights and criminal justice reform advocates, who point to his hard-line views dating back to the early 1990s. "William Barr's record suggests he will follow Jeff Sessions' legacy of hostility to civil rights and civil liberties," said Faiz Shakir, the American Civil Liberties Union national political director. "Barr must commit to defending the rule of law and civil rights, not serving as a political arm of Trump's anti-constitutional agenda." In 1992, for example, Barr penned a note attached to a Justice Department document titled: "The Case for More Incarceration." In his note, Barr writes that "there is no better way to reduce crime than to identify, target, and incapacitate those hardened criminals who commit staggering numbers of violent crimes whenever they are on the streets." After leaving government, Barr returned to the private sector, where he held several senior executive positions, including with GTE Corporation and Verizon Communications. His daughter, Mary Daly, currently leads the Justice Department response to the opioid crisis.